Lynn Marie Isobel Murphy was born December 15, 1946 in Summerside, PEI. She grew up on a potato farm in Clermont, PEI. She completed grades one to eight in the local one-room school, then attended Kensington Regional High School. 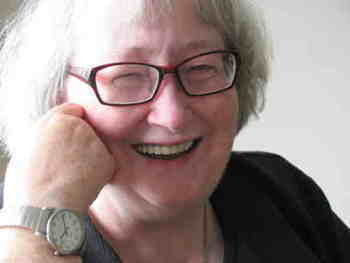 Her later education included : BA, Saint Dunstan's University; BEd, University of Prince Edward Island; MLS, Dalhousie University; certificate in archival studies. After completing her library service degree, she worked in university, special, and public libraries, and also as a freelance bibliographer. Murphy moved to Halifax in 1968. As a credit toward finishing her BEd, Murphy took a course at St Mary's called "Women and chldren first : a history of education as a means of oppression." The professor made her a gift of the first issue of Ms. magazine and after that, she says, "there was no turning back." With some Drama Club friends, Murphy went to see the Canadian film Fortune and Mens Eyes, set in a prison where gay men are bullied and raped. Once Murphy saw that movie, she became radicalized. "I was very close to one of the gay men in the Drama Club, and I knew that as an occasional user of marijuana he was at that time vulnerable to arrest and imprisonment, and possibly similar mistreatment. The first principle of gay politics that I latched onto was, 'Well, they can't do that to Stephen!'" "At that time I was becoming more and more aware of the gay community," says Murphy. "and I took part in the Jury Room protest (against a refusal to serve people they perceived as gay). When I had my first serious relationship with a woman, I kind of came out in a big way, but was still closeted to my relations in PEI." "At that time the gay community here tended to believe there was no such thing as a bisexual - you were just too afraid to admit to being gay," says Murphy. "The lesbian separatist community, to which I was drawn politically, admitted that there was such a thing, but bisexuals definitely weren't 'real' lesbians, and of course I agreed with them. By and large, GAE was a more accepting home for me." And a very active home, too : at that time there might be as many as three people runnning for each executive position or to be chair of one of the comittees. Within GAE and GALA, Murphy served at different times on the Executive, the Management Board and the Civil Rights Committee. 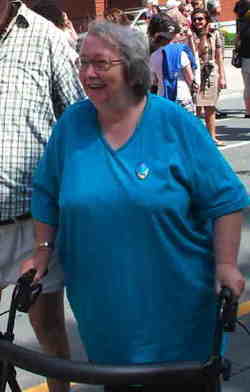 She is proud of having chaired the Committee that organized the first Pride Week after the implosion of GALA in the 90s. "There were a lot of hard feelings that year, and some even suggested that we should give up on Pride Week. But we persevered, and even made money. I think it was about $115.00 "
Later she was active with the WildeBunch; Atlantic History and Archives Network (a gay/lesbian group, despite the nondescript name); and two one-year initiatives, the Making Waves Collective, and the Sisters' Lightship Collective. She also worked as a volunteer with Red Herring Cooperative Books, and helped to build their popular gay/lesbian section. In 2010, Lynn was on the NSRAP Board, and became active in the founding of Elderberries, a social group for LGBT seniors, helping to organize a monthly Potluck Social, and editing the email newsletter. Murphy's partner from 1980 was Arthur Sniders. Sniders was also an LGBT activist: he chaired GAE and several committees. They married in 2001, and he died two years later. In 2012 she was awarded the Queen's Diamond Jubilee Medal for her work with the LGBT community, and in 2015 she became the first recipient of NSRAP's LeighannWichmanAward for Lifetime Achievement. As of 2015, Lynn is living in Halifax and is still active with Elderberries. She raids Value Village for affordable detective fiction and threatens to finish writing her half-done historical mystery set in Tusket Lakes in 1799. She has also taken up painting, mostly memory pieces in a folk-art style. A cancer and stroke survivor, she takes part in Ai Chi (a water-based version of Tai Chi) exercises two to three times per week.